Every year at the beginning of December your inbox starts to fill up with requests for donations from worthy non-profit institutions. And especially given recent events, we know that there are many worthy causes that are urgently vying for your time, attention, and donation dollars. I’m writing because I know you agree that the arts play a crucial role in shaping and reflecting the kind of society we want to live in, and are in need of your support now more than ever. It’s hard to believe, but the String Orchestra of Brooklyn is now in the middle of its 10th anniversary season. Over our first ten years we’ve performed experimental works at the Museum of Modern Art and free children’s concerts in Fort Greene Park. We played the opening gala of the new Whitney Museum of American Art and a 4th of July fireworks event in Coney Island for the Brooklyn Cyclones. 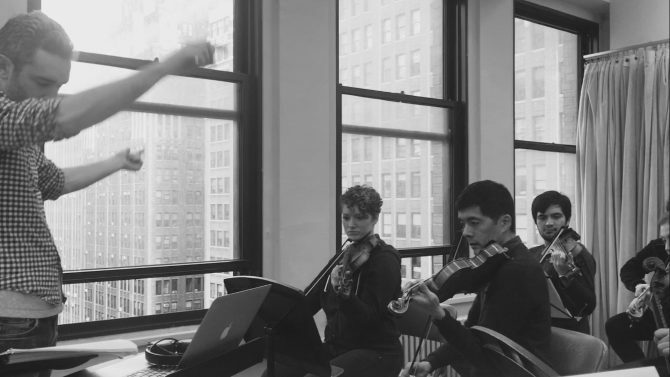 We’ve partnered with amazing organizations, started an annual contemporary music festival, helped train a new generation of musical leaders through our regular conducting workshops, and we’re now in the middle of recording our inaugural album. All of these programs have been made possible by the talent and passion of our amazing group of volunteer musicians and the generosity of the wider community who support us. The next ten years will bring a new slate of opportunities and challenges, and we’re counting on your continued support to help us along the way as audience members, volunteers, and donors. If you’re able, please consider making a donation today to help us meet our year-end fundraising goal of $15,000.